VICTIMS OF LEPROSY: EYE OF THE SOCIETY. 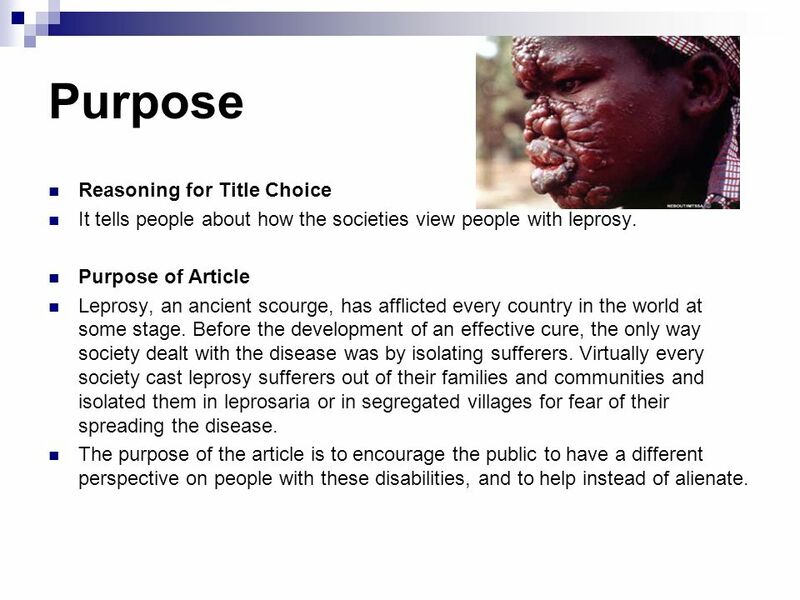 Purpose Reasoning for Title Choice It tells people about how the societies view people with leprosy. Purpose of. 2 Purpose Reasoning for Title Choice It tells people about how the societies view people with leprosy. Purpose of Article Leprosy, an ancient scourge, has afflicted every country in the world at some stage. Before the development of an effective cure, the only way society dealt with the disease was by isolating sufferers. Virtually every society cast leprosy sufferers out of their families and communities and isolated them in leprosaria or in segregated villages for fear of their spreading the disease. The purpose of the article is to encourage the public to have a different perspective on people with these disabilities, and to help instead of alienate. 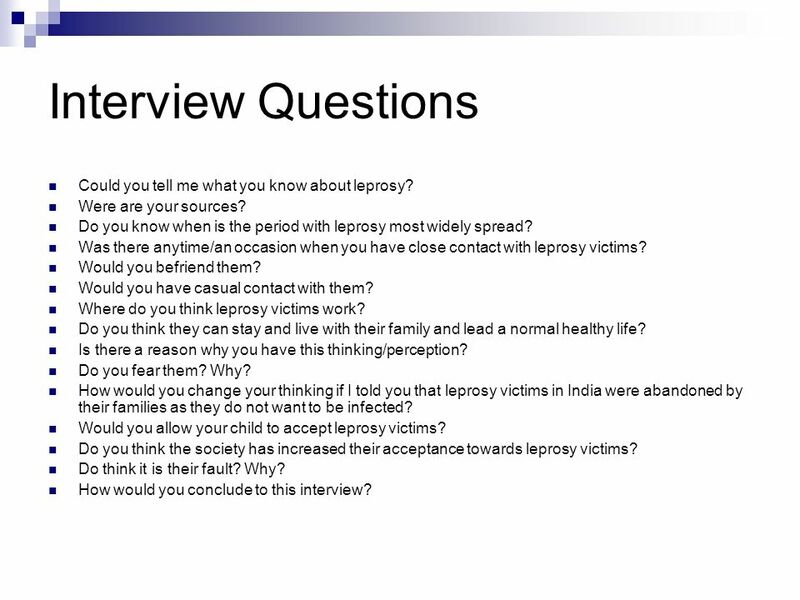 3 Interview Questions Could you tell me what you know about leprosy? Were are your sources? Do you know when is the period with leprosy most widely spread? Was there anytime/an occasion when you have close contact with leprosy victims? Would you befriend them? Would you have casual contact with them? Where do you think leprosy victims work? Do you think they can stay and live with their family and lead a normal healthy life? Is there a reason why you have this thinking/perception? Do you fear them? Why? How would you change your thinking if I told you that leprosy victims in India were abandoned by their families as they do not want to be infected? Would you allow your child to accept leprosy victims? Do you think the society has increased their acceptance towards leprosy victims? Do think it is their fault? Why? How would you conclude to this interview? 5 Difficulty I found difficulty in many prospects. Firstly, I was quite disgusted initially when I looked at the picture of these victims, having their arms and fingers decay and drop off. In addition, I conducted an interview of my parents and sister on what they knew about leprosy. 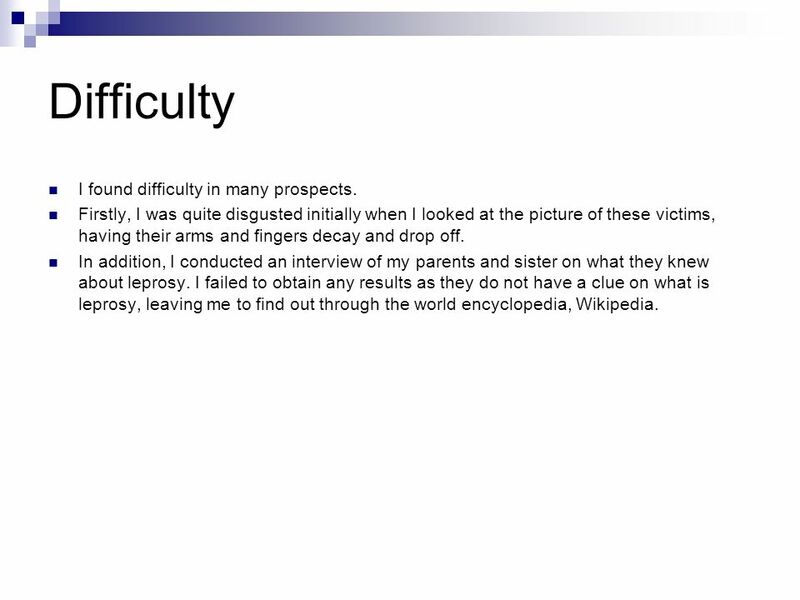 I failed to obtain any results as they do not have a clue on what is leprosy, leaving me to find out through the world encyclopedia, Wikipedia. 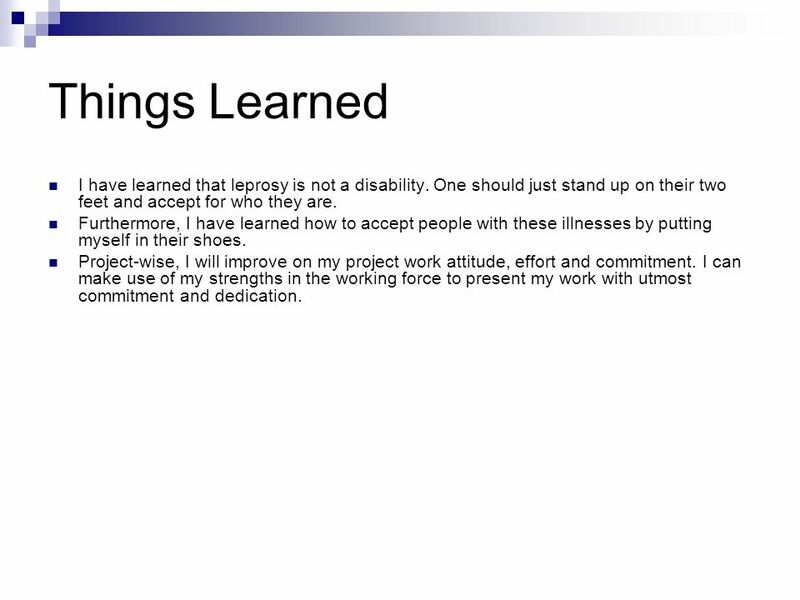 6 Things Learned I have learned that leprosy is not a disability. One should just stand up on their two feet and accept for who they are. Furthermore, I have learned how to accept people with these illnesses by putting myself in their shoes. 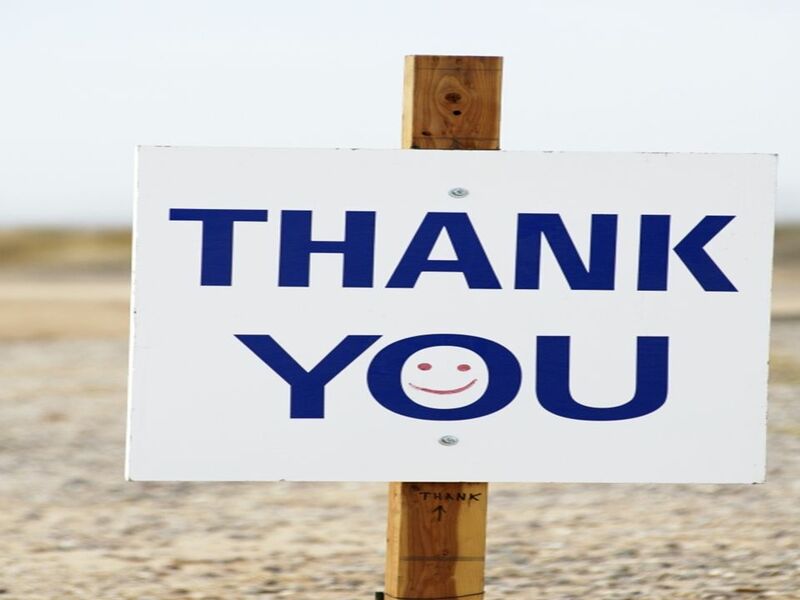 Project-wise, I will improve on my project work attitude, effort and commitment. I can make use of my strengths in the working force to present my work with utmost commitment and dedication. 7 In the future… That being said, actions speak louder than words. I may try to improve the lives of ex- leprosy victims in Singapore through providing them with basic care and love. Project- wise, I will improve on my project work attitude, effort and commitment. I can make use of my strengths in the working force to present my work with utmost commitment and dedication. 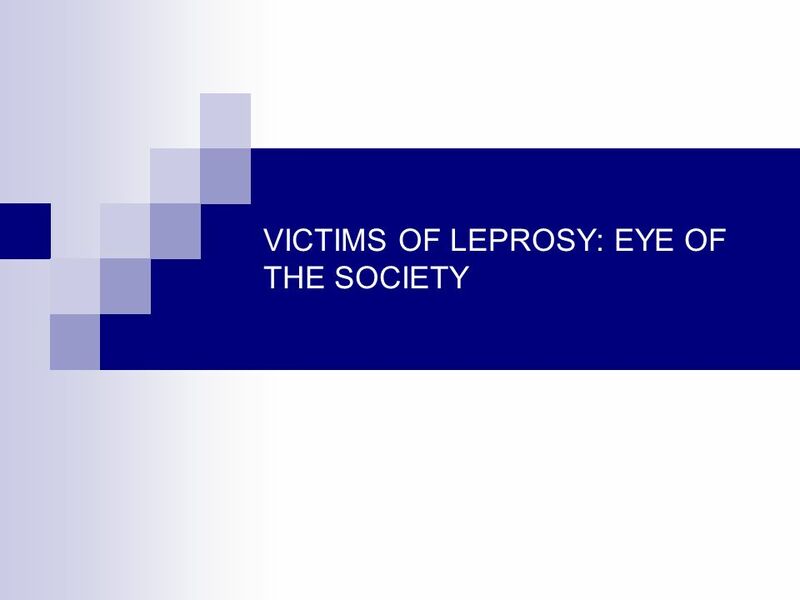 Download ppt "VICTIMS OF LEPROSY: EYE OF THE SOCIETY. Purpose Reasoning for Title Choice It tells people about how the societies view people with leprosy. Purpose of." You are going to create a power point on a career/job that you want to achieve in the future. 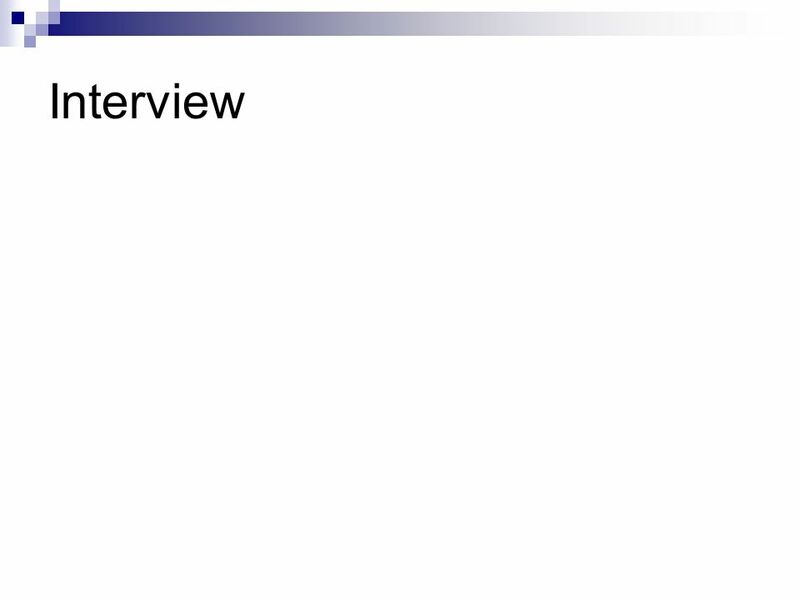 Each slide will give information about the job/career you. Dr P Henn Your words remembered for years The SPIKES model Developed by oncologists as a structure to break the news of life limiting disease. I’d Love You To Want Me Lobo NQ-TP When I saw you standing there I about fell off my chair. Face To Face With Leprosy How do the members of the public view them? How do they treat them? For consideration. It is said that the physically handicapped are tolerated in the society but the reality is a bit different. We would rather call it. Dear Diary… Year 5 Writing. Monday 17 th September 1348 Dear Diary, I can’t believe it; the more I try to help people, the more they are dying. I just. SUPPLEMENTS: INFORMATION, IMPORTANCE, AND BEST PRACTICES Robin Hamilton and Jon Urish, Beloit College. Notes for teacher Resources: 0 Print 15 of slide 10 0 Print 1 each of slides (or more if you want) Learning Outcomes: 0 Recognise famous people with. Stages of Grief Objectives 1.Name situations that might cause a person to experience the 5 stages of grief. 2.Identify characteristics of each of the stages.  Know the facts  Examine our attitudes  Face our fears  Come together. CRISIS CRISIS fighting for hope for homeless people KS 3 Lesson Plan 1 Exploring the meaning of Home and Homelessness A Teaching Resource for Secondary. Living With Diabetes Feelings about diabetes and how it affects your family or partner. LEPROSY VICTIMS: ACCEPTED OR AVOIDED. PURPOSE Reasoning for Title Choice 1. Find out if leprosy is accepted or avoided by Singaporeans. Purpose of Article.